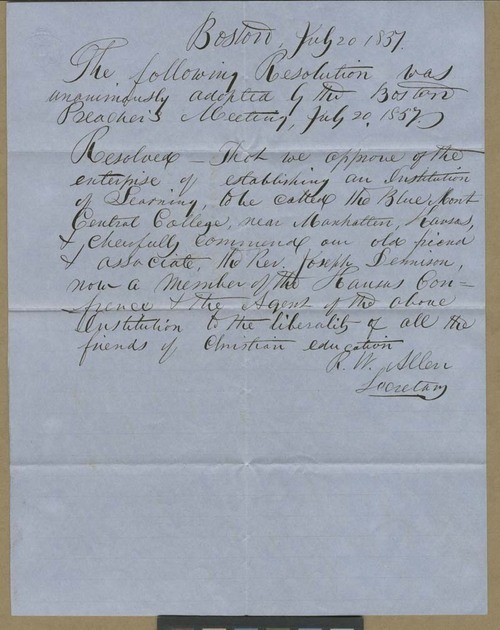 This resolution, "unanimously adopted" by the members of the Boston Preacher's Meeting, approved the establishment of Blue Mont Central College near Manhattan, Kansas Territory, by Reverend Joseph Denison, an "old friend" of the Boston Preachers. Denison had emigrated to K.T. following Isaac Goodnow, and was working with him to obtain support for the college.